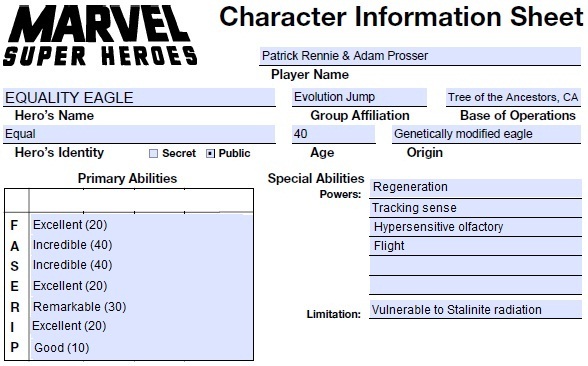 Legal Status: Citizen of good standing of the U.S.A. Defector from the U.S.S.R.
Place of Birth: Stalingrad, U.S.S.R.
Base of Operations: Tree of the Ancestors, California, U.S.A.
Power Source: Genetically modified bald eagle with implanted superscience power source. Powers: Super-strength, super-agility, and regeneration powered by a Brezhnevite generator grafted to his heart. Flight from natural bald eagle body. Speech from genetic modification. Enhanced tracking ability from natural eagle sight and genetic modification of olfactory sense. Weaknesses: Stalinite radiation nullifies superpowers from the Brezhnevite generator, reducing them to normal levels for an eagle. This is especially disorienting for Equality Eagle because the only time he has experienced those levels is on those occasions he has been exposed to Stalinite radiation. Equal has significant problem moving around in any but the largest rooms built for human occupation. It is a well worn joke among human criminals that the best way to defeat Equality Eagle is to run indoors. When flying solo, Equal tends to focus on hero work that lets him work outside. With Evolution Jump, Equal usually works as containment or transportation when the rest of the team has to go inside. When he has had to pick a fight inside of human structure, any foe contemptuous enough to let him get close find themselves dealing with a superstrong, superquick opponent armed with razor sharp beak and claws. History: During the Cold War, the Soviet Union ran multiple superpower programs to keep pace with the superheroes being produced by the United States and its allies. The research efforts to make a next generation of Stalinite generators that powered much of Soviet superpower technology resulted in the creation of the Brezhnevite organic generators, which could easily be grafted to living things. The one downside of the technology was their sensitivity to the radiation given off by the Stalinite generators. That radiation is mildly cancerous to humans and difficult to weaponize, so Stalinite generators are usually shielded. However, a superpower source that was weak to a power only the Soviets controlled was not one with much of a downside for a society that wanted to control its superheroes. In addition to enhancing humans with powers and technologies, efforts were made to uplift various animal species in order to use them as labor or troops. The project to combine Brezhnevite generators with the genetically modified animals resulted in Equal. Bald eagles had been included in the genetic experiments for the propaganda value of having America’s national animal as a loyal communist. For a while, Equal was their premier success from the bald eagle line and served the Soviet Union as a superhero in the Army of Communist Creatures. Inevitably, the world-spanning threats that the superhero community regularly respond to meant that Equal had a chances to interact with American superheroes. Knowing he existed because he was their symbol, Equal was discretely fascinated with their history and culture. Eventually, he became convinced that the flaws of the U.S.S.R. were worse than those of the U.S.A., and he defected. Always pleased to steal one of their enemy’s superheroes, the American government welcomed Equal to their country. The Gorilla Gorgon Foundation, a non-profit that tries to ensure that all sentient non-human animals have food and shelter, took Equal in and gave him a home. Through them, he met other sentient animals, some of whom also spent their free time as superheroes. 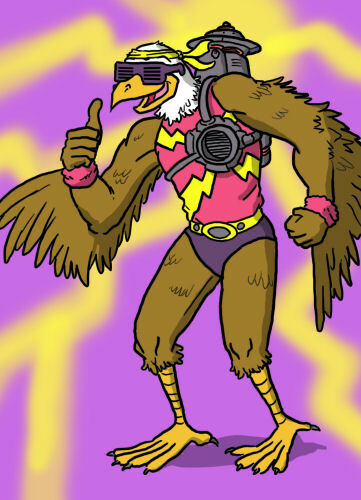 After serving an apprenticeship with the South Dakota Gryphons, Equality Eagle was offered a junior spot on the animal-themed superteam Evolution Jump. In 2013, Equality Eagle has served for decades as one of the backbone members of Evolution Jump. When he is not superheroing, Equal runs the non-profit Eagle Sight and Flight, which sponsors education initiatives around the world. He also attends fundraisers for the Gorilla Gorgon Foundation and is deeply involved in human rights issues. Currently, Equal is unwelcome in his homeland due to his intense criticism of President Putin and Russia’s poor treatment of homosexuals. Immortal Mouse – The result of a science experiment gone wild, Immy survived and gained super-intelligence and immortality. She modified herself to enable her to speak and to manipulate objects. She is one of the technology wizards of Evolution Jump and often acts as reconnaissance for the group. She enjoys embarrassing Equal at parties by telling the story about the time he swallowed her. Equality Lass – While other Evolution Jump members have taken to using radio controlled robotic hands to work around their lack of opposable digits, Equality Eagle continues the practice of hiring a personal assistant to help out with such business. His latest personal assistant decided to call herself Equality Lass rather than simply go by her given name. Equal finds this highly amusing. South Dakota Gryphons – A multi-generation team of gryphons and humans that operates out of South Dakota. The team mostly concentrates on emergency services rather than fighting criminals. Red Bear – As a product of the same Brezhnevite generator experiments as Equality Eagle, Red Bear took Equal’s defection poorly. Laser Phoenix – An AI with a hologram body made of lasers, Laser Phoenix earns her living as a mercenary. Doing jobs she has been hired for sometimes find her in conflict with Equality Eagle. Kingmaker – A CIA operative that specialized in developing and installing American-friendly dictators during the Cold War. His activities repeatedly put him at odds with the democracy loving Equality Eagle. Calculusaur – A math-themed dinosaur villain, Calculusaur picked a fight with Equality Eagle because he thought Equal’s name had something to do with math. Much to the dinosaur’s disgust, Equal’s powers have nothing to do with math but were still able to defeat Calculusaur. Patriot Gauntlet – Equality Eagle’s former Soviet handler found himself in deep trouble when Equal defected. He agreed to undergo a superpower experiment and try to capture Equal. He survived the fall of the Soviet Union, and now his attacks on Equal are purely personal. Theme: Equality Eagle’s primary story theme would be the need to strive to fulfill a set of ideals in a world that can never properly realize them. This is a theme the character shares with the likes of Captain America or Superman but has the added tension that he is coming from a situation where his original set of ideals has already completely failed him. Story Role: Equality Eagle is either a title character or a main character in a team book. He has enough going on to generate plots, villains, and supporting cast on his own. He can also be used to play off characters who are carrying their own stories, especially those that need an authority figure on the team to rebel against. Game notes: While the power of flight was applied to the character through the backdoor as a feature of the animal, it is offset by combat penalties when the character fights indoors. The weapon damage from Equal’s beak and claws should be the same as a normal eagle’s with appropriate adjustments made from his stats. Despite his animal nature, there is no reason he would not be able to operate with a superteam that consisted mainly of humans. Ha ha, AWESOME alt-caption for the image.